Liz's Journal - Cape Town to St. Helena. You have to understand the South Atlantic weather system to appreciate it. Cold front after cold front march across the South Atlantic from the Antarctic peninsula. 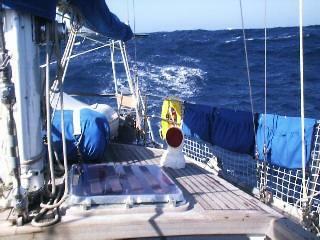 There is a very small weather window that allows you to depart from Cape Town and sail in May. If you miss the window you may end up waiting for over six months. The window came on the 4 May 1999 and after a quick stock up and hurried goodbyes to friends and family we left, not knowing when we would ever see them again. Miles of ocean in front of us, and our final destination unknown, our first stop was St. Helena a British colony island in the middle of the South Atlantic. Three days out of Cape Town we experienced our first storm. Call it a baptism of fire, we were tossed in to the deep end. There were two storm systems to the south of us generating confused and monstrous seas. We were, however, warm, safe and happy in Gilana's womb like interior. Ok, truth be told, we were a bit scared, having never done this before. The waves were coming from both left and right and mom and dad stood one hour watches. After which they were exhausted, my mom wrote a line in the log book. "my knees did knock together in fright"
Gilana is a Van de Stadt designed and professionally built Corten steel hulled ketch, that is a sailboat with two masts. She weighs about 65,000 pounds, and is very very strong, comfortable and safe.